The Ducati Monster 696 is a perfect example of how you can continuously improve a motorcycle model without just increasing engine size. Iâ€™ve tried a few monsters before, and although the monster has always had a high fun factor, the 696 is something special. I donâ€™t know a first thing about what kind of rating the 696 has been getting in the printed motorcycle press. It doesnâ€™t matter because a day in the saddle on this little beast was one of the best times Iâ€™ve had on a motorcycle in a long time. The bike has a comfortable riding position not too upright to be all grandpa, and not too forward leaning to get you sore wrists. 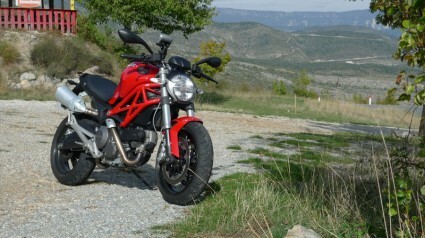 So both city riding and back country riding is a no brainer on the Ducati Monster 696. Of course subsonic speeds on the freeway is not itâ€™s natural habitat, but thereâ€™s still plenty of power to start a speeding ticket collection. First thing youâ€™ll notice is how the 696 operates and handles like a charm covered in sugar. Everything just match each other. Front brakes and clutch is an easy two finger operation and the rear brake has the feel you need to brake without fear of locking up the rear wheel. Light weight and the 160 rear tyre makes the bike very willing to flick from turn to turn. There is one kink in the glory however. The Ducati is very compact, which I guess if you are more than 180cm can make you feel a little crammed. Iâ€™m 175cm and after getting used to the feeling of being â€œclickedâ€ on to the bike I actually think itâ€™s one of the bikes forces. I couldnâ€™t help thinking of the hovering scooter things from the forest chase scene in Star Wars Return of the Jedi. Another thing you have to appreciate is the grumpy snarl it gives when you twist itâ€™s ear a bit and push it through the revs. Even with standard factory cans the sound is exactly as it should be. Iâ€™m not sure Iâ€™d even change them if it was mine. Speaking of sound. That annoying whining rattling clutch sound Ducati used to be known for is all gone. Some Ducatisti loved it, I know. But Iâ€™m glad they changed the clutch system and got rid of that sound. You could go on and praise the 696 Monster. But what remains is that this is a motorcycle who will suit beginners and experienced riders equally fine. Beginners will appreciate the easy handling and hassle free control. The more experienced will appreciate the amount of abuse this bike can take on the twisting back country roads. Do a track day on the Monster 696 and watch your mates surprise when they struggle in the hairpins on their 1000+ccm bikes while you gracefully overtake them. A Ducati Monster 696 is a perfect example of the truth in the saying that you have to control the motorcycle, not the other way around. That is exactly what this motorcycle is all about. Thanks to Columbus International for providing the test bike for this review. Impression after 8-10 hours of riding the Monster 696. I’d go and sit on one and see how you feel. Else try the 1100 that’s probably a little bit larger. “One should never judge a motorcycle by how quickly it will get you past that big truck in front of you, but rather by how well you designed it and lovingly assembled it to your own standards”. I was happy to see a review on your site. I hadn’t seen one in a while. You provide a different perspective. Good review! 600cc – 900cc Standard/Sport-standard is my favorite category. I might try a test ride at the local Duc dealer the next time my buddy asks me to go to one of their events. 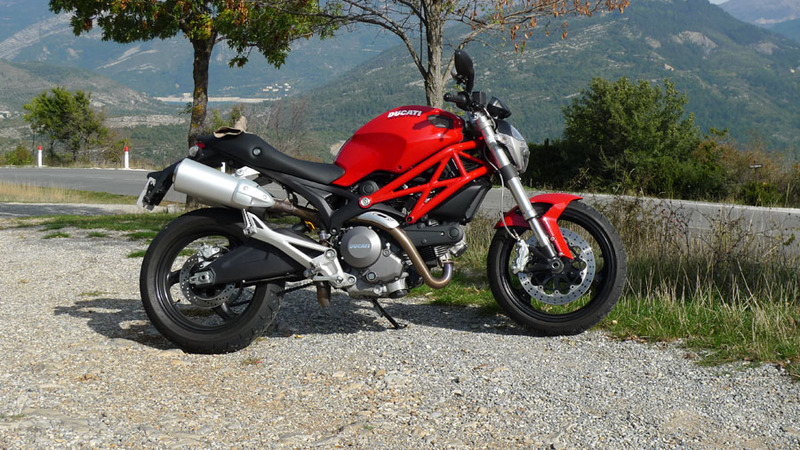 Thank you sir for posting both merits and demerits of the dream bikes.A Ducati Monster 696 is the best vehicle for many bike lovers including me and thanks for posting the full description of Ducati Monster 696. Sounds like a screamer in the turnies. How “lift-happy” is the front tire? Do you have to be careful on takeoffs? If not, I’d still love to hear your answer here. @Mike. I didn’t have any problems with lifting. The riding position is some what forward leaned. But I’m sure it can pull wheelies if you want it to. The advantages & dis advantages of any vehicle should throughout studded which will leads us to choose correct vehicle . Good bike, but I prefer to pay the difference and have a 1100 in the garage. @Miguel, yea I would probably try and get a 1100 for a spin before I made my decision. But I’m still leaning towards the 696 because of the fun factor. @David thanks, David. I’m glad you found it useful. Great review Jesper, I’m siding with you on this one, although I think the 1100 is a awesome bike the 696 looks much more fun. 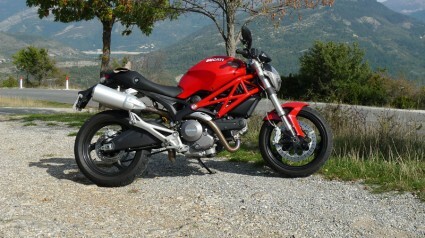 The old monster 620 and 750 also had a wet clutch just like the 695 and 696 which is why the “rattling sound” is “gone”. It was never there. The 800, 900, 1000, 1100, s4, s4r, s4rs monsters all had/have dry clutches with the rattle. Whatsoever Ducati rules the sports world. I am so fascinated by this brand that I always dream of riding a ducati sports bike. I am just waiting for this prestigious moment. I am willing to buy this bike. Its really a perfect vehicle. This motorcycle is one of the best i have ever ride. Helmet Hair – Motorcycle Blog	Powered by WordPress 74 queries. 0.717 seconds.